As a puppy, Mr. Peabody was never adopted because he was more interested in reading books than fetching sticks. Years later, when he finds an abandoned baby, he wants to give the boy the home and love he never had. He's given court approval to adopt the boy, whom he names Sherman. The world’s most accomplished dog, Mr. Peabody teaches Sherman about all kind of things and introduces him to time travel. However, when Sherman goes to school, a classmate named Penny makes fun of him for having a dog as a father. 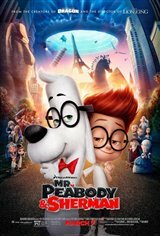 To smooth things over, Mr. Peabody invites Penny and her parents over for dinner, but when Sherman tells Penny about the time machine, she convinces him into using it without permission. They travel back to ancient times, but when they return, history begin to change and the space-time continuum spirals out of control. It's up to Peabody, with his genius-level IQ, to go back in time and set everything back to normal. Based on the classic cartoon by Jay Ward.